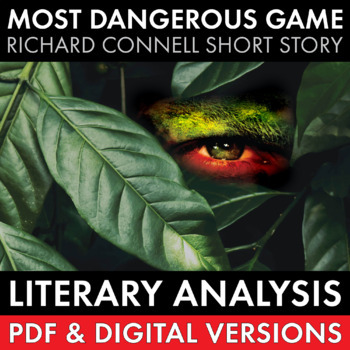 Use the classic short story, “The Most Dangerous Game” by Richard Connell to teach your students the elements of literary analysis. 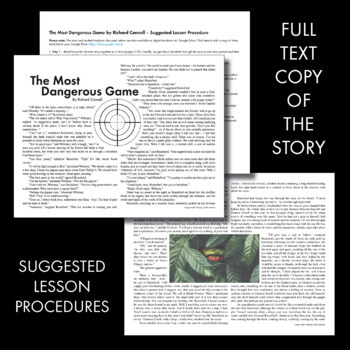 This three-day lesson plan includes the full 9-page story with attractive illustrations, an 8-question deep-thinking exercise (with detailed answer key/class discussion starters), a simile hunt worksheet (also with answer key), and an optional writing/creative activity where students can choose from a menu of four options as they dig deeper into their understanding of the text. This zipped package also includes an mp3 audio file. Interested in more short story materials? Click HERE for a budget-priced FOUR WEEK short story unit. NOTE: This item is included in my English 9-10 full-year curriculum. If you already own the full-year download, please do not purchase this item here individually. 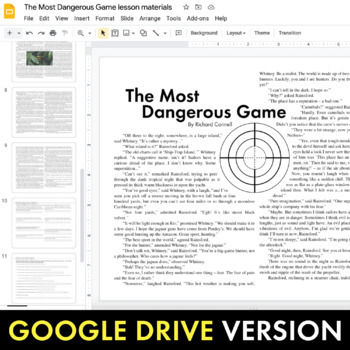 If you’d like to receive this item plus everything else needed to teach 180 days of English 9 or English 10 at a deeply discounted price, click here to learn more about the full-year curriculum download.